The interactive Off Broadway parody where you pick the groom! From the creator of The Awesome 80s Prom comes New York’s newest interactive sensation, That Bachelorette Show! 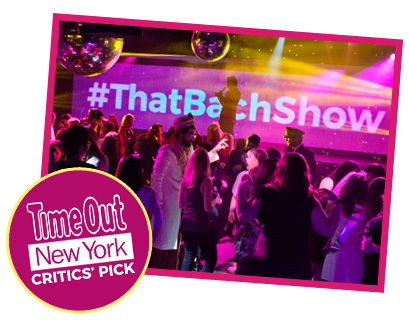 Staged in the legendary nightclub The Copacabana, this interactive spoof of ABC’s “The Bachelorette” will have you dancing to your favorite 90’s hits, spun by superstar DJs, as our spoof-tastic bachelors compete for your vote. “I highly recommend you see That Bachelorette Show!” – Applause! Applause! After 8 years and no ring, Adriana Orlando just broke up with her high school sweetheart, Giovanni Giovanni. Desperate for a new start, she’s putting her love life in the hands of That Bachelorette Show, where she’ll meet some of the most eligible and spoof-tastic bachelors in the world! With all these choices, how will she pick which man she’ll marry? At That Bachelorette Show, you’ll mix, mingle, and dance it up to your favorite radio hits, spun by star Guest DJs, as all of our bachelors vie for your vote. You’ll watch them compete in dance contests, ab-offs, and more. And over the course of the show, they’ll slowly be eliminated until only one remains, who will walk off into the sunset with Adriana. The rest are up for grabs!